Happy 1 Year Anniversary CondorWatch! We want to give a huge THANK YOU to all the dedicated CondorWatchers who have helped us reach almost 340,000 classifications! We also would like to commemorate this time with a little recognition of the condors that we lost over the last year as well as some of the new birds that have come to join the free-flying California population. A big THANK YOU to wreness (our moderator extraordinaire) for her help compiling these photos and information and of course all she does for CondorWatch! 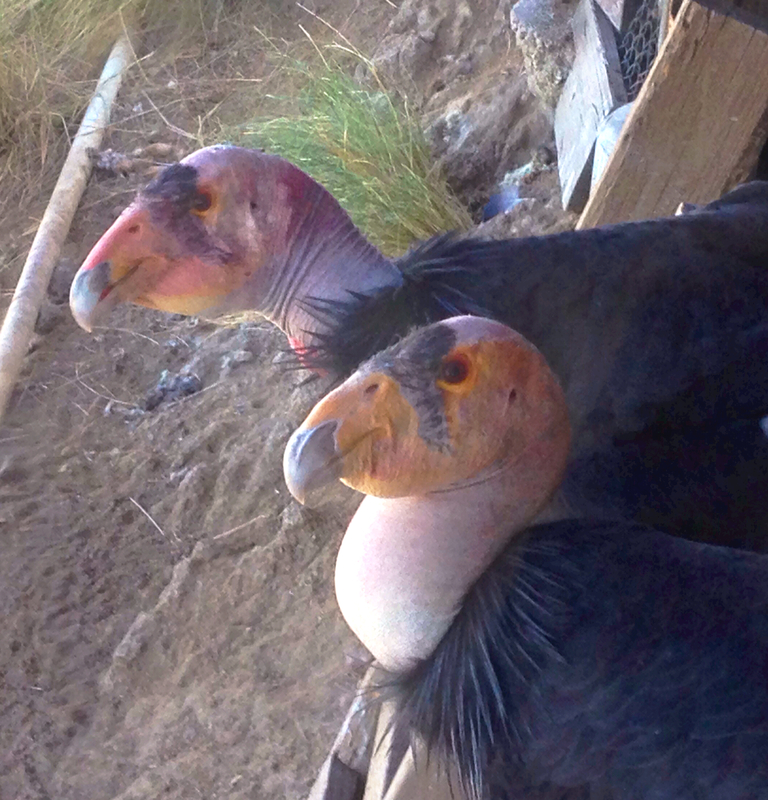 And the best news yet – a record 16 pairs of condors have made nests in CA so far in 2015! So, lets hope we have a record number of wild-fledged chicks in 2015! We see them so frequently in the photos – sometimes 6 years in their lives – and they get to be familiar faces. It is always heartbreaking to see in a condor’s Bio that it has died from lead poisoning but hits harder when you have seen this bird in hundreds of photos. We sincerely appreciate your to help compiling data that can add a new tool to the arsenal in treating these condors before it’s too late. 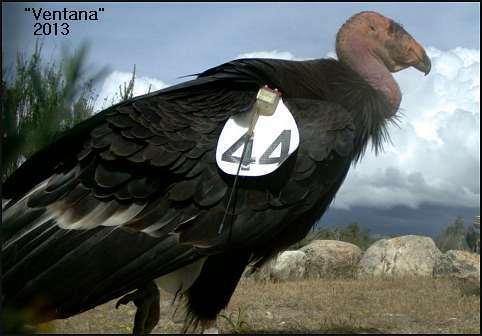 #444 was known as “Ventana” to the many condor spotters who searched the skies with their binoculars, She was hatched from an egg laid at the Los Angeles Zoo and was the first to be raised in the wild by condor foster parents. Also lost in the last year: Eight condors aged 3 weeks to almost 3 years of age to factors such as predation, trauma, and a few pending cases. So, we would like to take a moment to remember these birds but also to thank you for all your efforts gathering data to help California condors become a healthy free-flying population in California and beyond! We really do appreciate all you do so keep on carrion (as wreness would say)! And the Winners for The Best 2014 Photo Contest are (drum roll please)…. 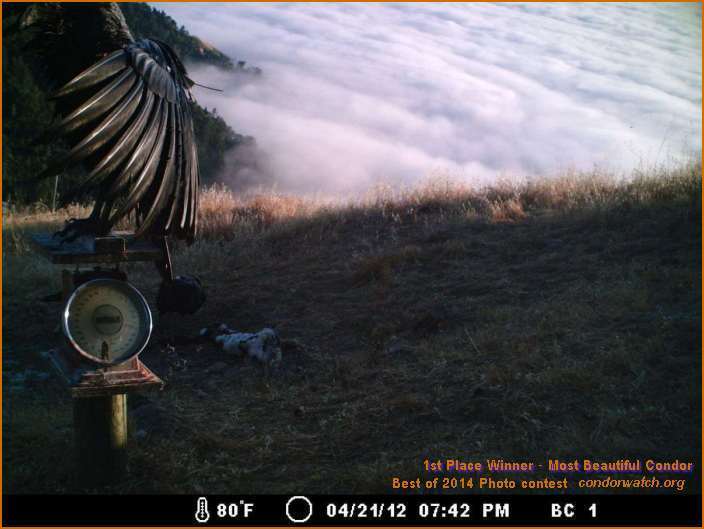 We have the results from our Best of 2014 Condor Watch Photo Contest – thanks to our very own amazingly talented wreness! CondorWatch photo contest extended until Jan 30th! Hi everyone! 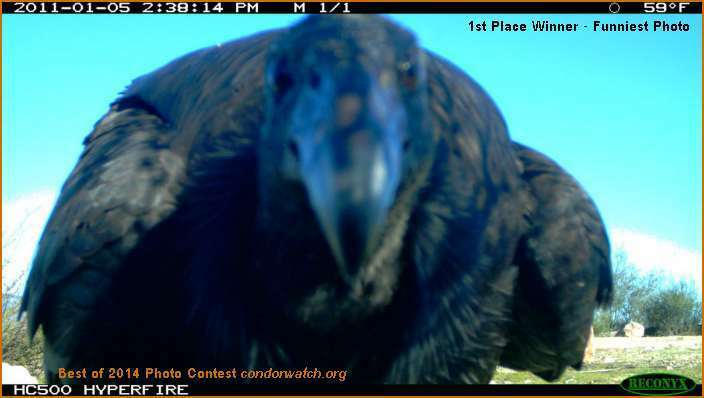 Due to some technical difficulties with the infamous “White Screen” – we have extended the First Annual Best 2014 CondorWatch Photos Contest until January 30th at 8pm Central Time, USA. Here are the categories and instructions again, for your convenience. 16} What Were They Thinking? Look though the photos on the CondorWatch site to find your favorites for the listed categories below. You may enter 3 photos per category. The Image number we ask you to enter comes from the entire URL of the Zooniverse page that the image is on. For example http://talk.condorwatch.org/#/subjects/ACW00045qp would be the first entry’s page. You can find the best photos of the site in the CondorWatch Citizen Scientist’s Collections, since they have been saving all the great photos the last 8 months CondorWatch has been on Zoo! Click on a person’s name to go to their Profile Page and at the very bottom are their Collections. Names can be found on the message board posts and photo comments and also be found using the Search feature. The Image numbers can be seen in the bottom right corner each Collection thumbnail photo but they can be clicked to open up to full size but you can look through the whole Collection by magnifying your page and noting the Image Numbers this way. On the upper right side of the Collection page is a scroll bar to forward though the pages. You can also use the SEARCH feature at the top of the page to look for specific animals. This will only work once (the search feature doesn’t work too well right now) so to use multiple times, Refresh the entire page then re-enter your search word to use again. 2014 marks the first year CondorWatch joined Zooniverse and we would like to take the opportunity to thank all the Citizen Scientists who put in all the time and hard work tirelessly squinting into their monitors at carcasses, unidentified parts, angry pigs, various butts, tipped camera angles, vicious battles, fog and yes! beautiful condors to classify the data for us. Who could have imagined the incredible variety of situations, animals and emotions the cameras have captured? To celebrate we’d like to invite you to take part in helping find what you think were the Best Photos of 2014 for the CondorWatch Photo Contest. Woohoo! These are the categories for the photos. 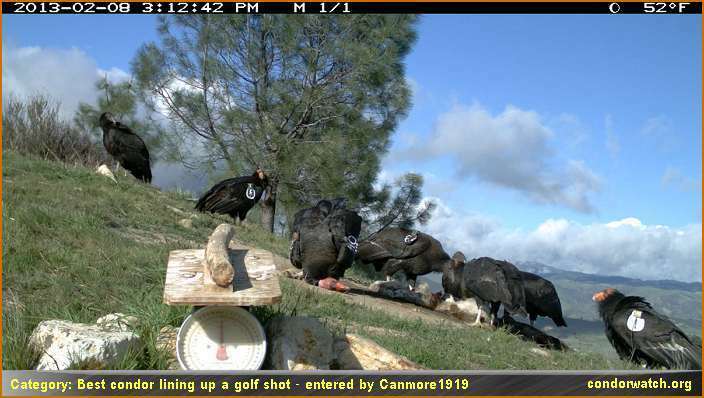 We hope they capture the majesty of the condors and also the humor that abounds on the site. Winners will be announced on the message boards on Jan 13th and shared elsewhere ASAP also! Please enter only once. Most of all, have fun and as always, carrion! Thank you for all your wonderful work and ideas this year. We couldn’t be where we are without you! California condor juveniles have darkish grey heads and necks and then around four years of age start to become more and more pinkish/orange/red (see the field guide for more information and photos of examples here and at the bottom of the wreness’s slidshow here) until they are about six years old when they obtain the full coloring of a mature adult. However, like everything, a condor’s color is not so simple. 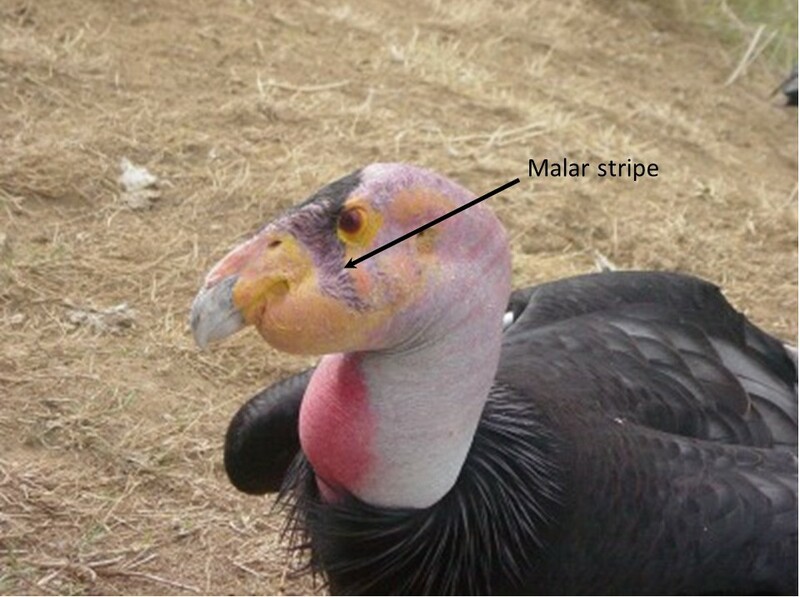 We have some special thoughts and tips about a condor’s ability to change their coloring from Mike Clark (aka the Condor Whisperer) who works at the Los Angeles Zoo and is truly one of the heroes of the condor recovery movement. In my opinion females have a yellower coloration from the malar stripe forward than males. Of course it varies from bird to bird. but if you put them side by side I find the females have a yellower face generally from the malar stripe forward. Males can have the same yellow in this place but it is usually shaded with a little more flushed coloration mixed in . This is not a hard and fast rule obviously. Topa Topa, stud book #1, he is a male. Topa Topa is the first condor brought into captivity – he was brought into captivity when he was very young (~1 years old) on 12 Feb.1967 as he was found injured and in poor health. He is too imprinted to be released to the wild but is the king of the condors at the Los Angeles Zoo and has fathered many of the free-flying birds you see in the photos! Malibu – a mature female condor and paired with Topa for many years as part of the Los Angeles Zoo’s condor breeding program. Another observation is that the mature adults tend to have a bluish neck. [Again, CondorWatchers recently noted a particularly blue neck here] When they get a hold of food and start to dig in on the food the neck flushes (if its exposed and the ruff isn’t up) and the neck turns more purple than blue. Can you guess from the descriptions above who here is the male and female of a current breeding pair at the Los Angeles Zoo? 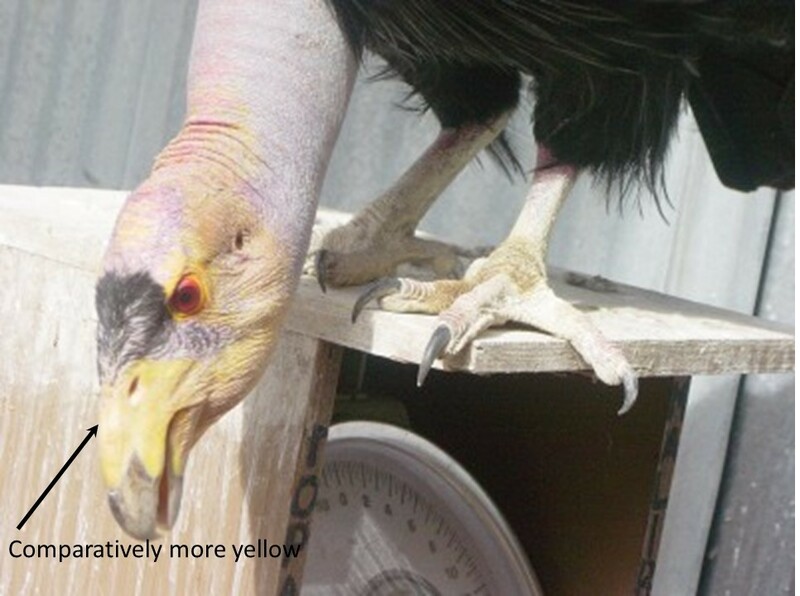 Let us know if you see any extreme examples of these color variations by tagging the photos – especially if you see a condor with a bluish/purplish color when feeding! Who knows, maybe we will learn something new about condors and colors! 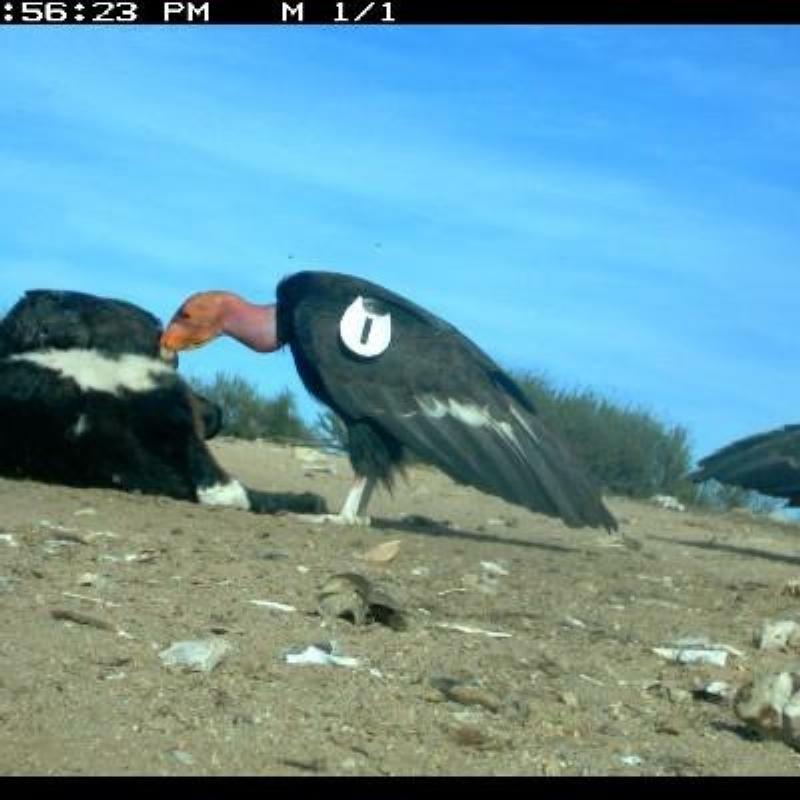 I was brought onto the condor project by my collaborator and friend Dr. Myra Finkelstein to help decipher potential variations in California condor diets among the flocks in central and southern California. Up until then, I had only seen live California condors at the Santa Barbara Zoo and stuffed condors in a diorama at the Santa Barbara Natural History Museum. 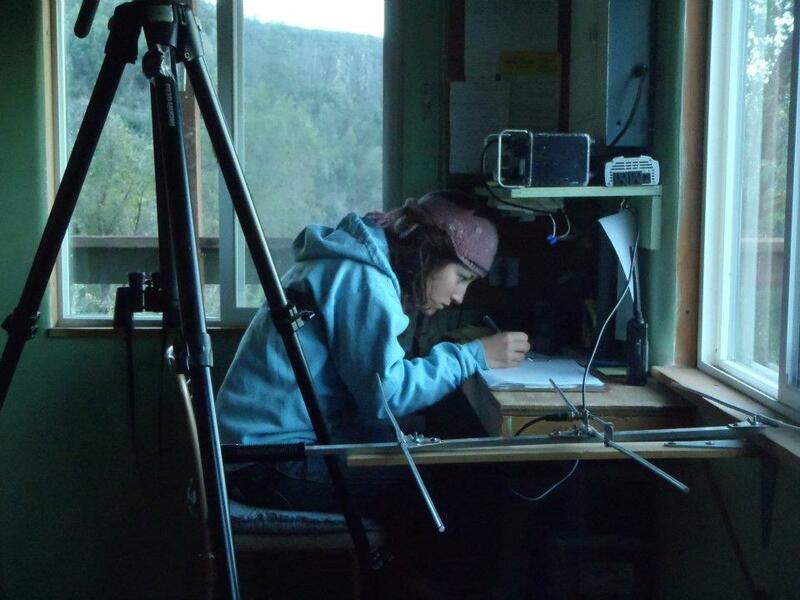 When the opportunity arose for me to join the US Fish and Wildlife Service for their summer condor round up and bird examination in summer 2011, I jumped at the chance. My son Jeremiah was four years old at the time and he and my husband Christian had already accompanied me on several field excursions related to my other projects, so I invited them along for three days at the Bitter Creek National Wildlife Refuge. We drove to their field site and met with the scientists who would be rounding up the birds for health monitoring, testing for lead poisoning, and blood sampling and drove to the condor pen. It was over 100 degrees, so very hot and somewhat desolate, but beautiful. 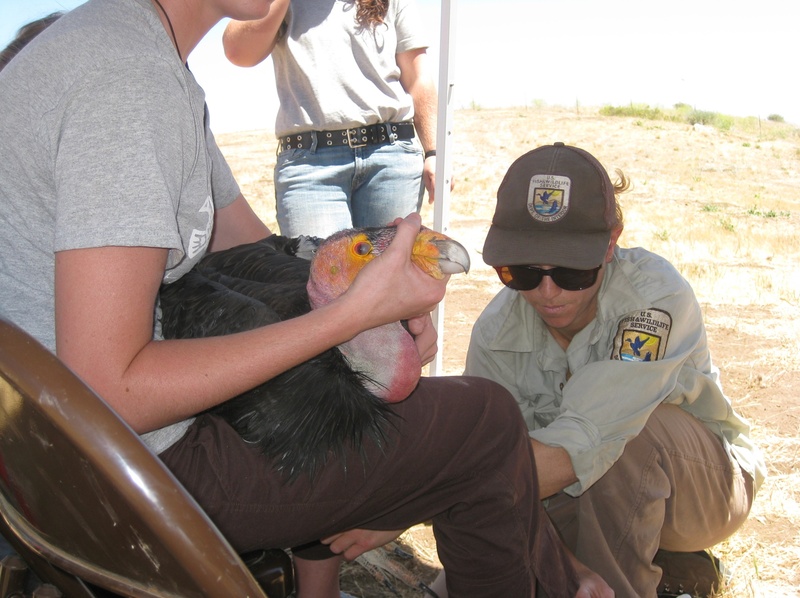 My job was minimal – watch the USFWS personnel catch the condors from the capture pen, label the blood collection vials and hand them to the scientists drawing blood, and keep my blood samples cold in a small cooler I had brought along for sample transport. I would spin the blood in a centrifuge later, back at our hotel, to separate the red blood cells from the plasma portion of the blood. I would later prepare these samples for stable carbon and nitrogen isotope analysis in my lab at the University of California San Diego. I then combined these data with isotope data from blood samples previously collected from these southern California condors and from birds in the central California flock to better understand potential dietary differences between the flocks and how these diet differences affect the health and well-being of the condors. The most amazing things about being up close to California condors were their incredible size and their overwhelmingly ugly-but-beautiful faces. It’s one thing to know that condors are the largest terrestrial bird in North America, with wingspans that range to three meters, but it’s another thing to actually see these birds up close and truly understand what such a large size really means. And, up close, their faces are so incredibly fierce and intimidating, that one can clearly see they share a common ancestor with dinosaurs. These birds look dangerous, but they were very mellow to handle and the USFWS personnel did an excellent job processing each bird. I have worked with many animals species in my work as a food web ecologist, but the condors are definitely one of my favorites. Especially because I got to share the experience with my young son. 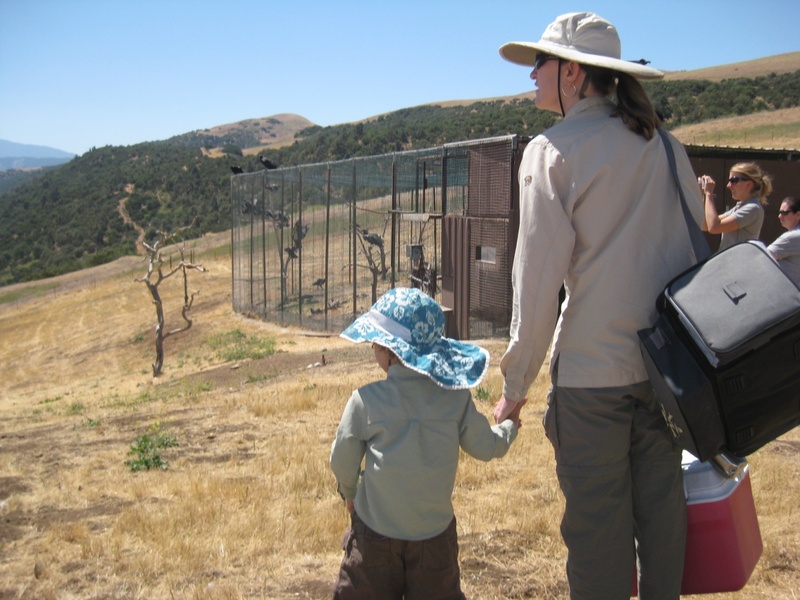 Dr. Carolyn Kurle and her then 4 year old son Jeremiah getting their first glimpse of free-flying California condors at the USFWS capturing pen in summer 2011 at the Bitter Creek National Wildlife Refuge in Southern California. The incredibly large wingspan of a California condor. 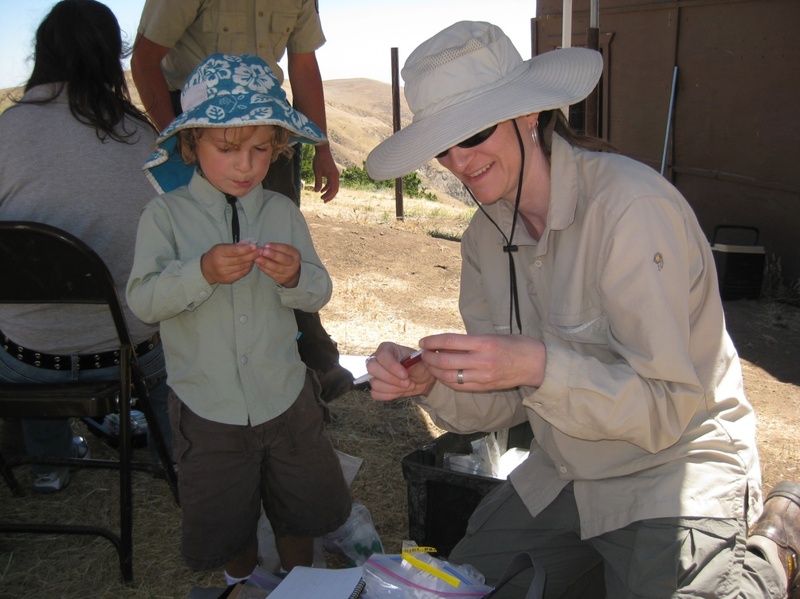 Dr. Kurle and her son organizing blood samples and preparing tubes for blood collection. The beautifully “ugly” face of the California condor. Update from The Condor Keepers at the Los Angeles Zoo Condor Lead Treatment Center on the condition of 463 and 481, who are being treated for extremely high lead levels. 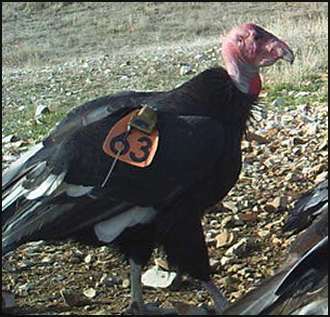 Condors 463 and 481 have both worn black underline tags but now wear white tags (white63 and white81). This update highlights the heroic and tireless efforts of the Condor Keepers for the survival of the condors. The Wiyot Tribe of Humboldt Bay describes the origins of mankind through a tale of survival and rebirth. The creator of all things, Gouriqhdat Gaqilh, had become weary of the wicked ways of man and summoned a deluge to drown the Earth and destroy all living things. The sole survivor was the great Wiyot hero Shadash, or Condor, who started a new civilization cleansed of evil. In 1860, about 100 Wiyot people were massacred while celebrating a ceremony honoring that tale of rebirth and survival. Like Condor, the tribe’s survivors endured. Today, the Wiyot still see condors—and condor feathers—as symbols of renewal. Recently, they performed their first World Renewal Ceremony in more than 150 years, with a gift of 48 condor feathers from the Sía Essential Species Repository. However, the jet-black plumage provides a glimpse into another story of survival—this time for the birds themselves. These condor feathers reveal the chemical traces of lead poisoning, a serious continuing threat to the population in California. Despite decades of progress, scientists still intensively manage the birds in the wild and continue to treat the ones exposed to lead. A new state law offers hope that the birds may endure for centuries, but lead poisoning—once unseen and unappreciated—continues to play a part in their private lives today. 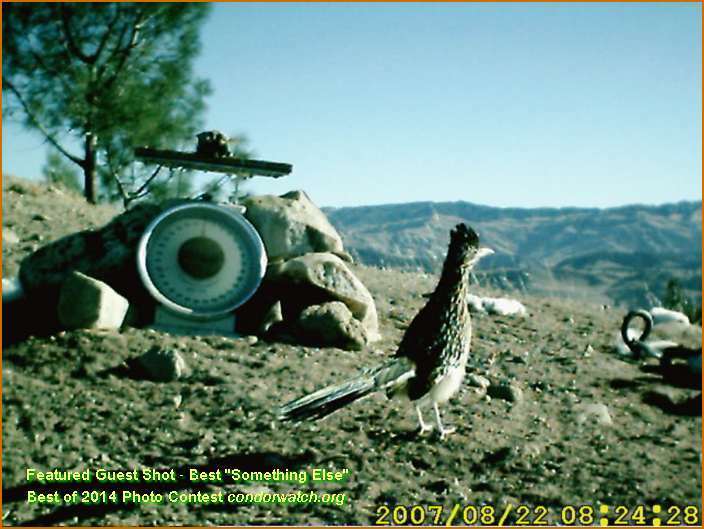 UC Santa Cruz toxicologist Myra Finkelstein is one of the researchers using feathers to tell this story. “Analyzing their feathers has really become a powerful way to understand what’s going on with these birds when they’re out there in the wild,” Finkelstein says. The California condor is one of North America’s most impressive and rare birds. It is the largest land bird on the continent, with a wingspan stretching nearly 10 feet. Wild condors can soar as high as 15,000 feet, and they fly up to 120 miles per day. With their large, cherry-colored eyes, the bald-headed birds scrupulously survey the terrain looking for carcasses of deer, cattle, and other animals. They devour carcasses, or carrion, with razor-sharp beaks, and they can store up to three pounds of meat in a part of their esophagus called a crop. Although these scavengers can survive two weeks without a scrap, they rarely have to because they have complementary admission to an all-you-can-eat buffet at feeding spots high in the back country, courtesy of researchers. In 1987, the International Union for Conservation of Nature designated the birds “extinct in the wild.” Conservationists placed all 22 known California condors into captive breeding programs at the Los Angeles Zoo and San Diego Zoo. In 1992, researchers reintroduced the condors to the wild and nurtured the population back to more than 400 birds. Today, more than half of these condors are free-flying in California and nearby states, but they are still “critically endangered”—largely due to lead poisoning. Survival has not been easy. Wild condors produce only one egg per clutch, and it takes them about six years to reach sexual maturity. This makes their population especially vulnerable to environmental hazards, such carrion contaminated by DDT, power lines, wind turbines, and microtrash: bottle caps, wires, and bullet casings. However, lead poisoning poses the greatest threat. In one study, scientists at the Minnesota Department of Natural Resources showed that lead bullets can fracture into tiny fragments, wildly scattering throughout an animal’s tissue like toxic hail. 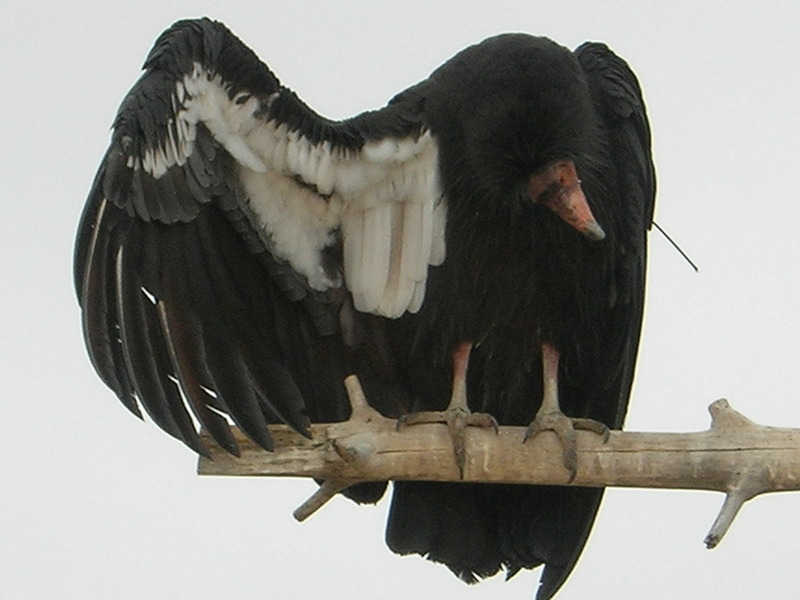 Only a few fragments are enough to poison a condor—equivalent to a few grains of sand. Condors unwittingly swallow these pieces after dining on unretrieved carrion killed by hunters. Once this lead enters the bloodstream, it migrates into the birds’ tissue, bones, and feathers. Lead exposure irreversibly destroys the myelin sheath that protects sensitive nerves, setting off tremors and impairing coordination. Severe poisoning can shut down the digestive system. The only way to remove the lead is by flushing it out of their blood with chelation therapy, which binds the contaminant with a drug. But often, the damage is already too great. 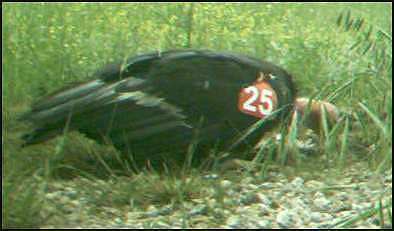 Evidence that lead ammunition was harming condors first came from a UC Santa Cruz study in 2006. Environmental toxicologist Donald Smith and former graduate student Molly Church found that the blood-lead concentration of condors released in the wild had increased tenfold since they were in captivity. 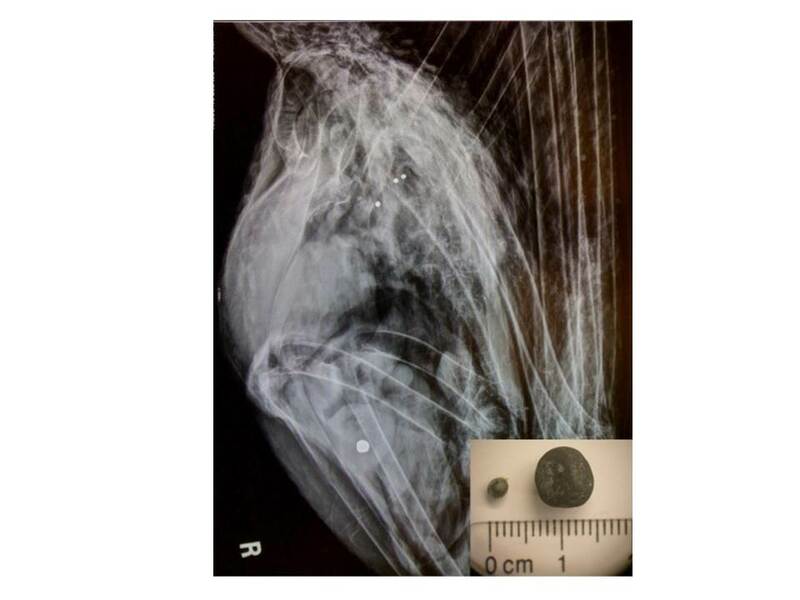 They determined that such severe lead poisoning could only arise if a bird had eaten lead and that the lead came from locally purchased bullets. In 2008, lead ammunition was banned in all condor ranges within California. Even with the ban, things haven’t improved. “At least half of them have been lead poisoned and have had to be treated at the L.A. Zoo,” Finkelstein says. Today, paired with blood-lead analysis, tracing lead exposure through feathers has become a powerful research tool. Each condor is tested for lead at least twice a year—more frequently if the bird recently suffered from lead poisoning. But blood tests can only show the bird’s current lead poisoning. A single fully grown feather can reveal the bird’s lead exposure from the previous four months. Testing the feathers require some high-tech tools. Researchers digest small pieces of a feather with acid, then pump it into an inductively coupled plasma mass spectrometer. This instrument uses a high-energy beam of electrons to ionize the feather solution with temperatures comparable to the surface of the sun. Now ionized, the feather atoms get sorted within a magnetic field, according to their mass and charge. A detector zeroes in on each sample, quantifying the feather’s lead. Like human hair, feathers contain mostly carbon, nitrogen, oxygen and hydrogen—the essential building blocks of life. But when a condor has eaten lead, large amounts of the heavy metal show up in its feathers. This painstaking approach allows Finkelstein to measure the degree of poisoning during the months before the blood tests. “We’re realizing that the blood monitoring isn’t even catching the tip of the iceberg for the degree of lead exposure,” Finkelstein says. “Even though the blood monitoring shows the lead exposure is of epidemic proportions and that they’re chronically poisoned, the feathers show that it’s way worse.” She found that one-fifth of free-flying condors have near-lethal or lethal blood-lead levels. And according to her population model, condors will only successfully recover when lead is completely removed from the equation. “The number of birds born just doesn’t make up for the number of birds that die. That’s what needs to change,” Finkelstein says. She and a collaborator are now improving the model to predict how lead poisoning impacts condor breeding and how hazards such as microtrash affect the birds as a group—as well as other animals. “Condors might serve as a canary in the coal mine for other species that we aren’t actively tracking on a daily basis, but who are also foraging on animals shot with lead,” Finkelstein says. The birds have a generously funded and well-staffed support system, which many other species don’t have. 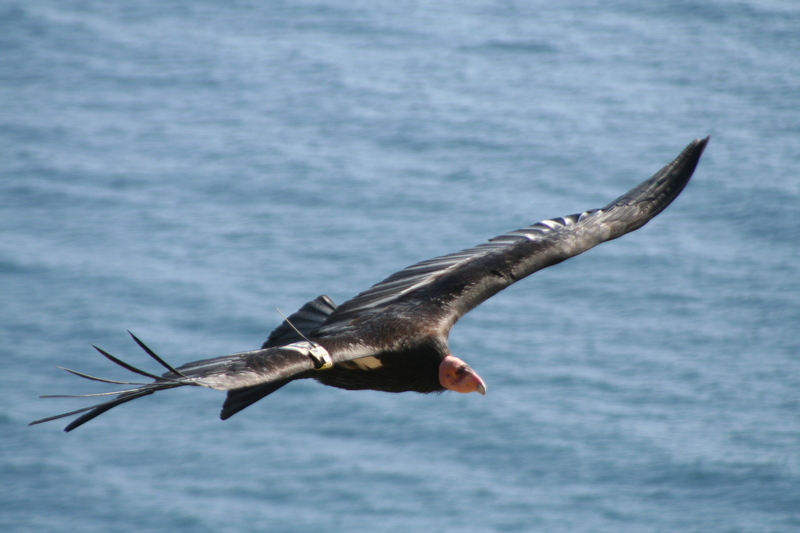 Scientists track condors using radio and GPS transponders. Indeed, the program’s researchers are daring adventurers, flying near treacherous ranges, and rappelling into unexplored ravines to find injured, poisoned, and deceased condors. 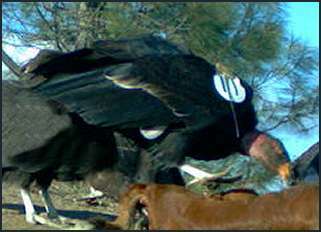 The team performs full necropsies on each dead condor they recover to determine its cause of death. 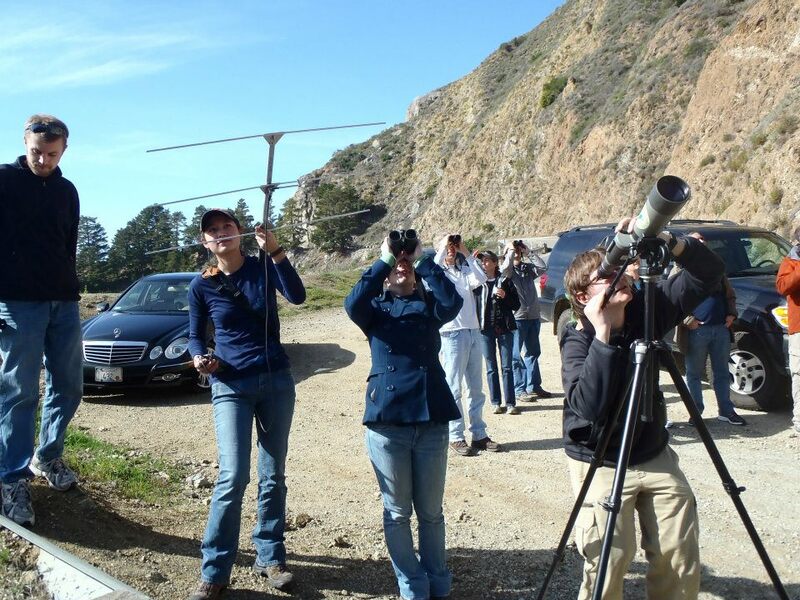 California condors also have new allies who don’t need to leave home to find adventure: citizen scientists. 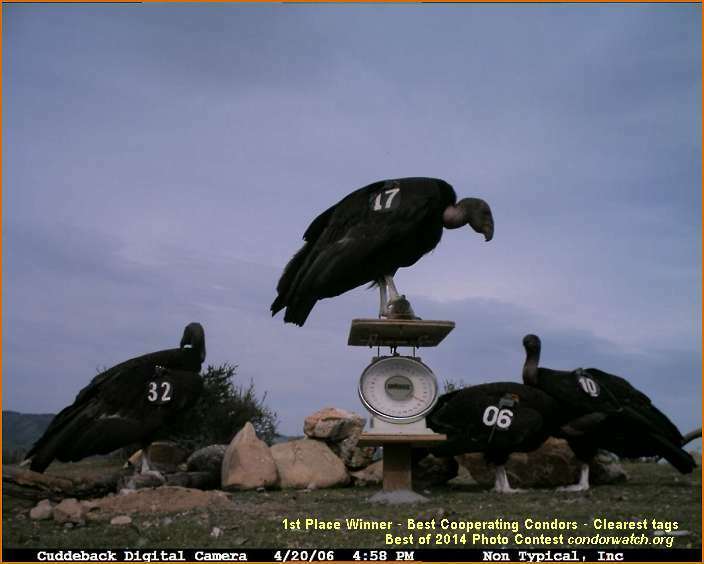 Using the online Condor Watch program, condor fans can explore more than 170,000 photos taken at feeding stations. This helps researchers keep track of the birds and their wildlife neighbors, such as mountain lions, bears, and feral pigs. 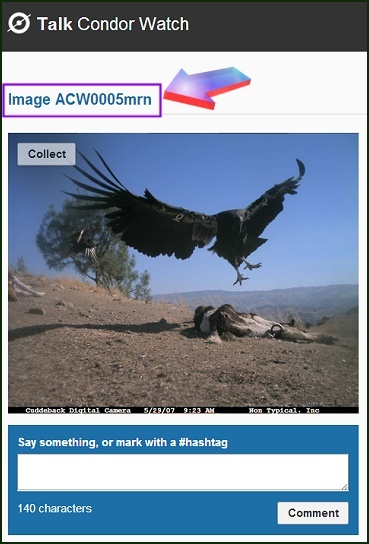 With each click, users can discover tidbits about each tagged condor. For instance, condor #32—the son of #42 and #39—was hatched in 2004 at the L.A. Zoo and is “still kickin’.” Aspiring condor aficionados can aid scientists and learn about their new feathered friends at the same time. The scientific studies and public support are making a difference. In late 2013, California Gov. Jerry Brown signed AB 711 after reviewing expert testimonies and the results of Finkelstein’s research. The bill will ban all lead ammunition in California by 2019, marking a transition into a safer era for condors and other scavengers. At least that is Finkelstein’s hope. 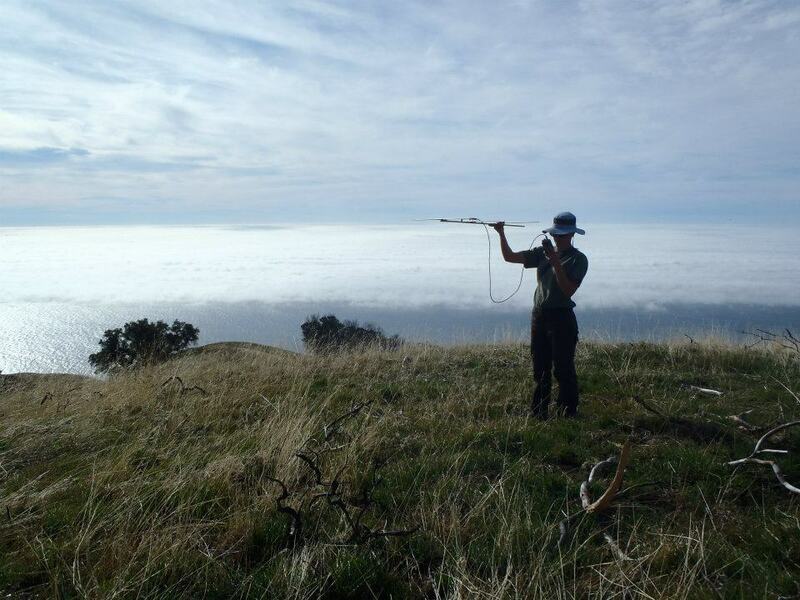 She believes that the new law, alternative hunting ammunition, and increased public outreach through programs like Condor Watch will help the California condor population grow, stabilize, and thrive. But the threat of extinction is still very real. 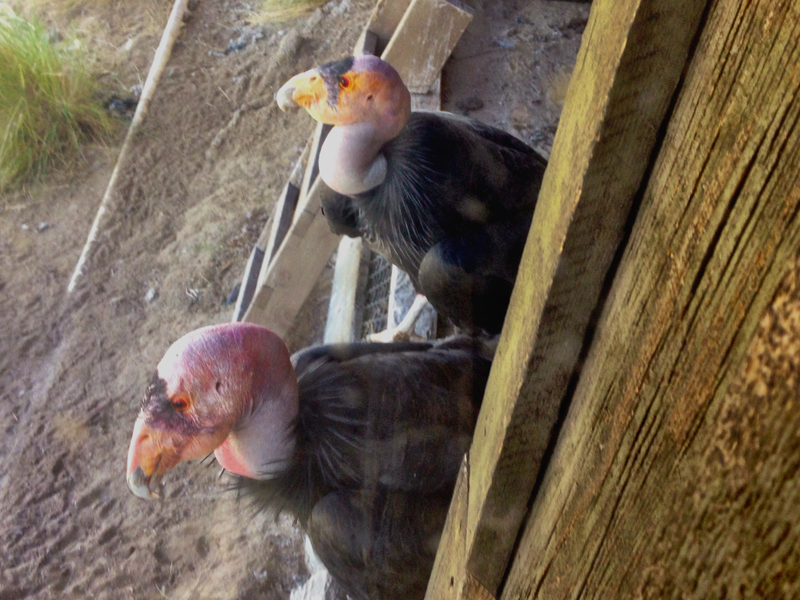 Californian zoos and organizations continue to treat lead-poisoned condors with chelation therapy. Despite the odds, the California condor may survive its own near extinction, much like its heroic namesake and the Wiyot people that revere them both. Alex Tamura, an undergraduate majoring in astrophysics at UC Santa Cruz, wrote this story in spring 2014 for SCIC 160: Introduction to Science Writing.